Steph & Kate are cats. Steph & Kate are our inspiration behind a lifestyle brand designed for kids, cats, and their parents. We are minimalists. We believe everything you have, should be your favorite thing. We aim to make pieces that are unique, have multiple functions and will last for more than one season. We are located in Carmel, Indiana where you can find a slew of other great makers, designers, and artists. We hope you find your favorite thing(s) at Steph & Kate. Steph is a gorgeous 13 year old Torbie with bright green eyes, who loves sleeping, lounging, and anything slow. Because of this, we are inspired by processes that honor the handmade, the antique, and keep in mind a classic style. 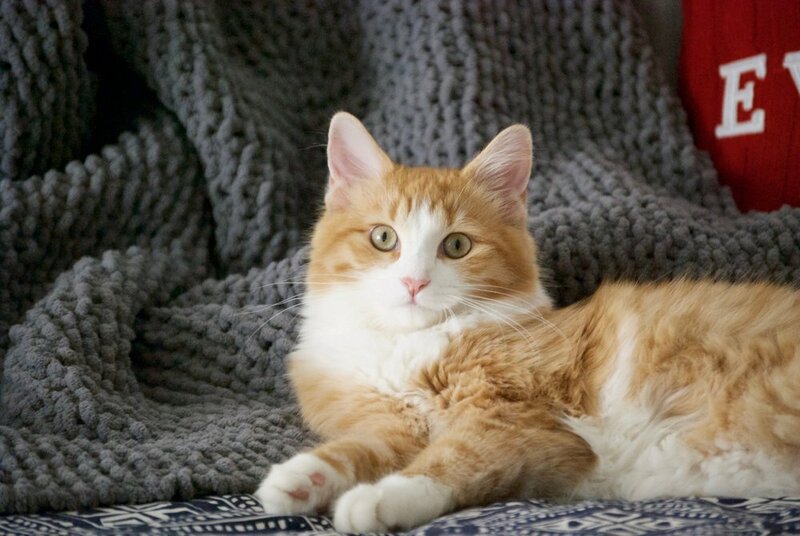 Kate, AKA (Squeaker) is a playful orange and white 2 year old cat with beautiful grayish-green eyes. She is quick, curious and enjoys everything new. Because of this, we use existing stock materials, keeping in mind a whimsical style.